Back in May, I was in New York City to treat Nestle’s Tollhouse Time “Sweetstakes” winner to a sweet tour of the city as one of her prizes. If you follow me on instagram, you may have seen a few of the pics. Well, I took a ton. 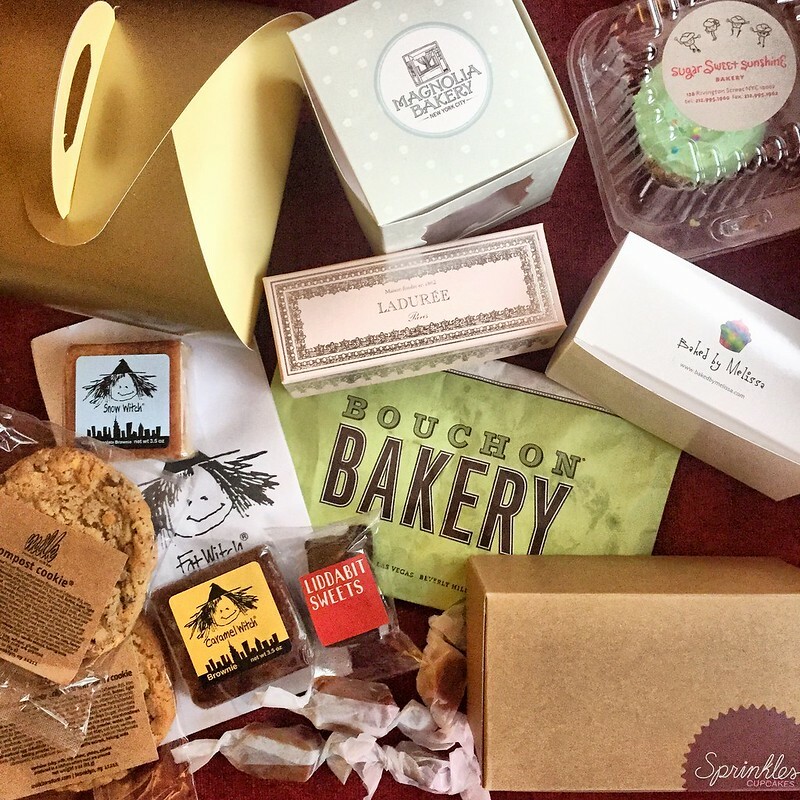 Too many to even show here, but I thought I’d share all the places we visited in case you’re looking for a sugar-filled way to see the city, too. 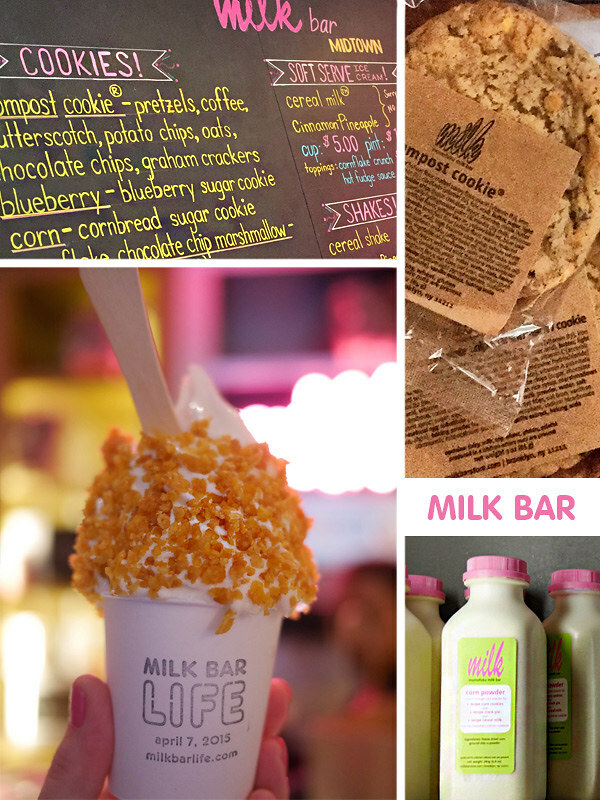 We started out at Milk Bar Midtown. I figured their Cereal Milk soft serve topped with cornflakes would be a great way to start the morning. But we also left with compost cookies, cornflake-marshmallow-chocolate chip cookies and candy bar pie. Stocking up for late night snacks you know. 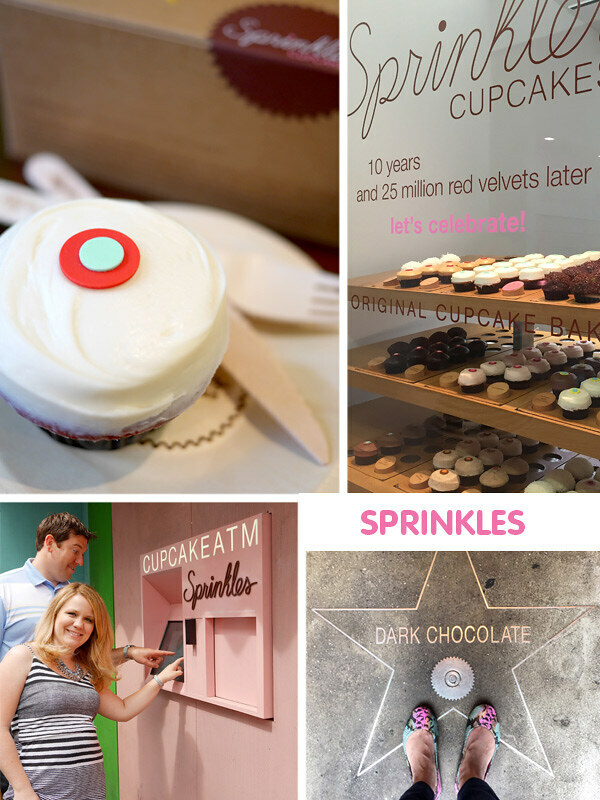 We went to Sprinkles Cupcakes next. This is Angela (the winner) and her husband. It was their first time so we grabbed a few flavors to take home and enjoyed a red velvet cupcake in the shop. It’s my favorite flavor after their black and white cupcake. 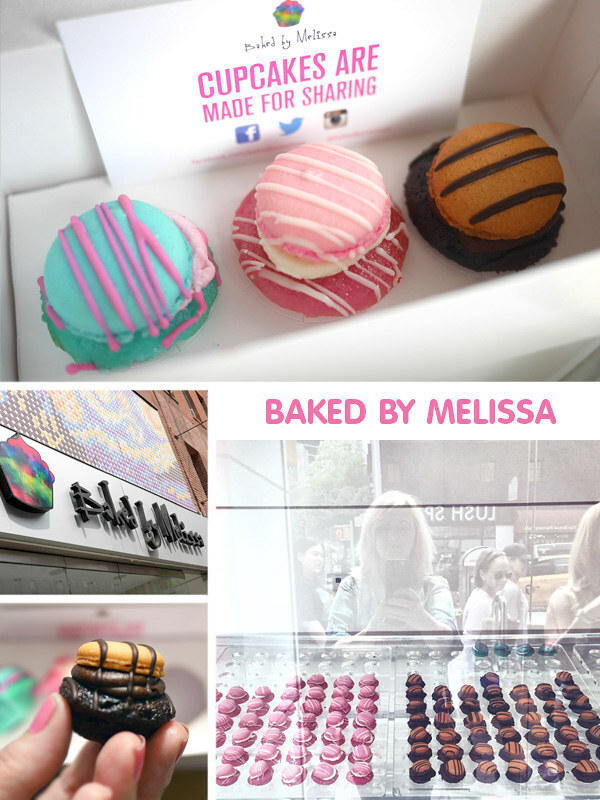 A couple of doors down is Baked by Melissa. These are the teeniest cupcakes. Smaller than mini and perfect for tasting… these one bite babies are just way too fun to eat and because they’re so small, you can try several flavors without feeling bad or full. I tried the PB&J in the store and brought these adorable “cupcarons” – macaron topped cupcakes – for the road. 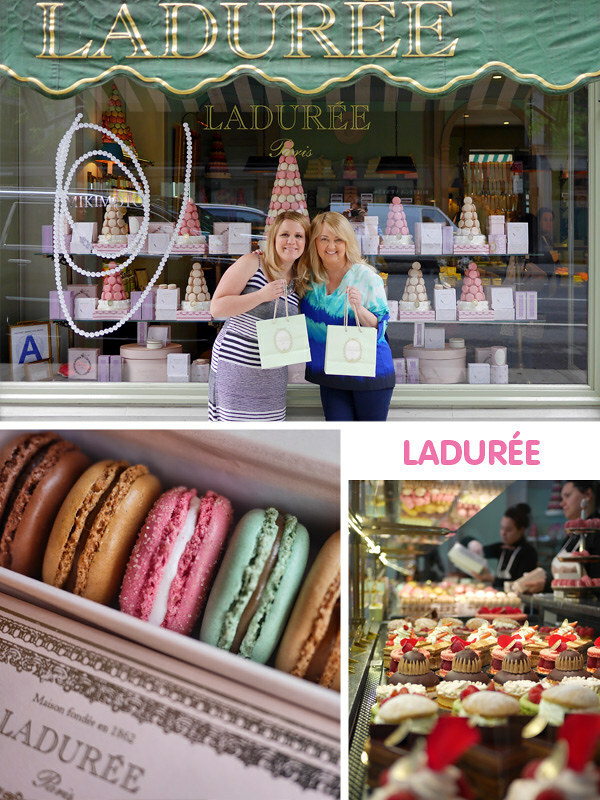 Next we stopped in Ladurée for french macarons. Oh my gosh I loved it inside – so pretty – and I didn’t want to leave. We couldn’t decide between all the beautiful pastries, so we left with just the macs. Sampling would take place in my hotel room later though. I had to pace myself you know. And also because we were heading to Levain Bakery next and I knew we’d be enjoying their decadent warm chocolate chip cookies on the spot. Head to NYC right now and get one of these. So so good. and big and warm. Bouchon Bakery was next. One of my faves. 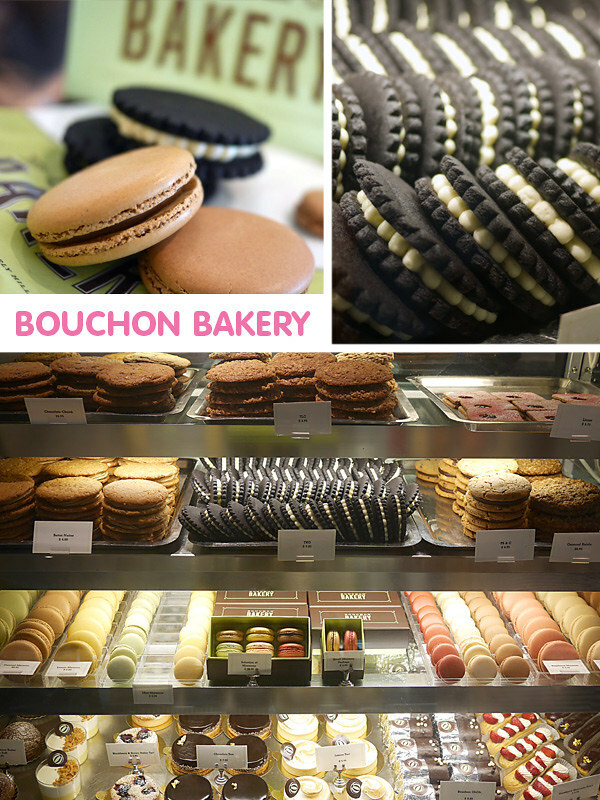 I absolutely love their macarons (get the big ones) and TKO cookie sandwiches. Like giant homemade Oreos. But better. After Bouchon, we headed down to Chelsea Market where we stopped in several shops. As a sidenote, I think the best thing I had here was actually lunch from Los Tacos No. 1. OMG The only mistake I made was only getting one. And I wish I had some right now. 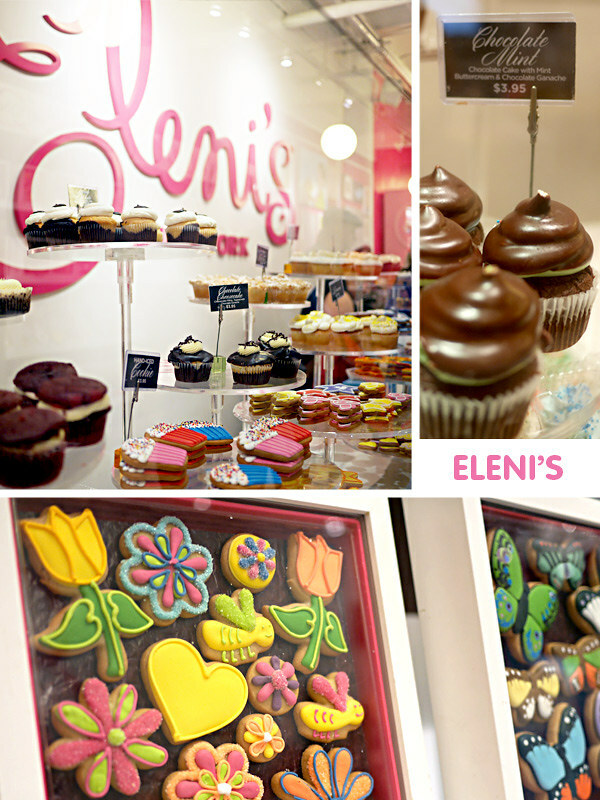 If you like sugar cookies, stop in Eleni’s and treat yourself to one. 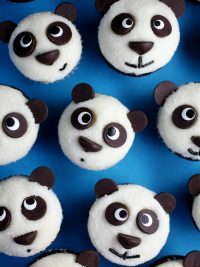 Or cupcakes, too. So fun! 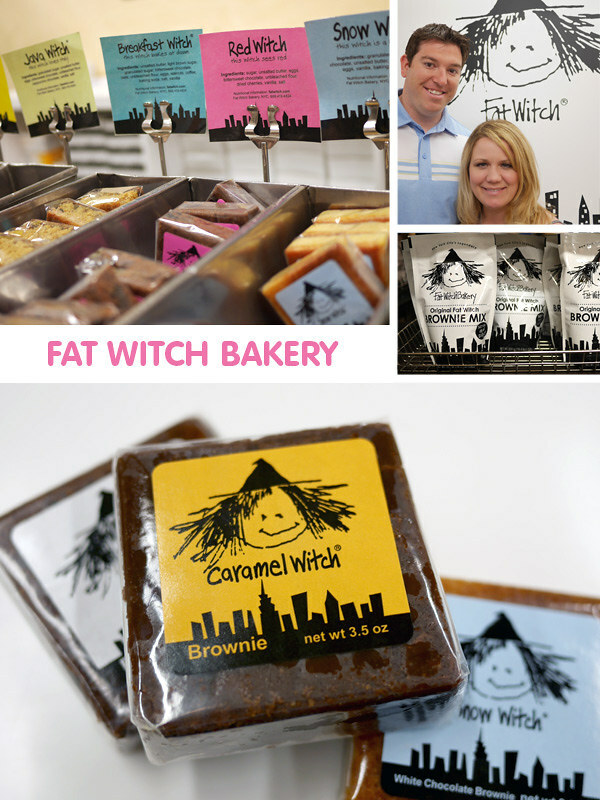 And if you like brownies, you’ll love Fat Witch with all their different flavors. Right about this point, I was super happy that these were packaged and individually wrapped. Easy to grab and save for later because I was still trying to pace myself. 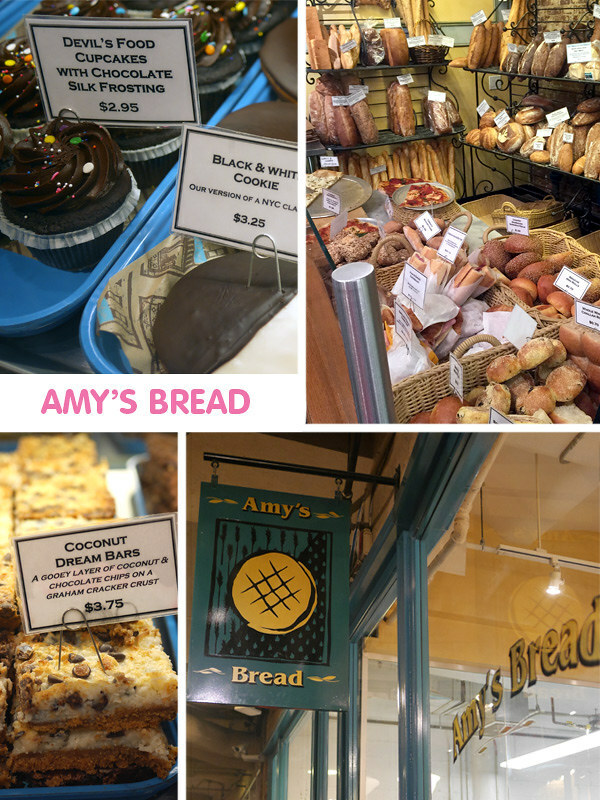 Amy’s Bread has tons of baked goodies to choose from like cupcakes, cookies, bars and breads. 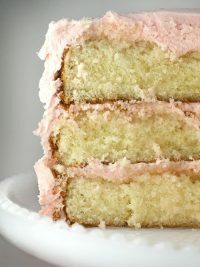 Try the Yellow Cake with pink frosting if you get a chance. 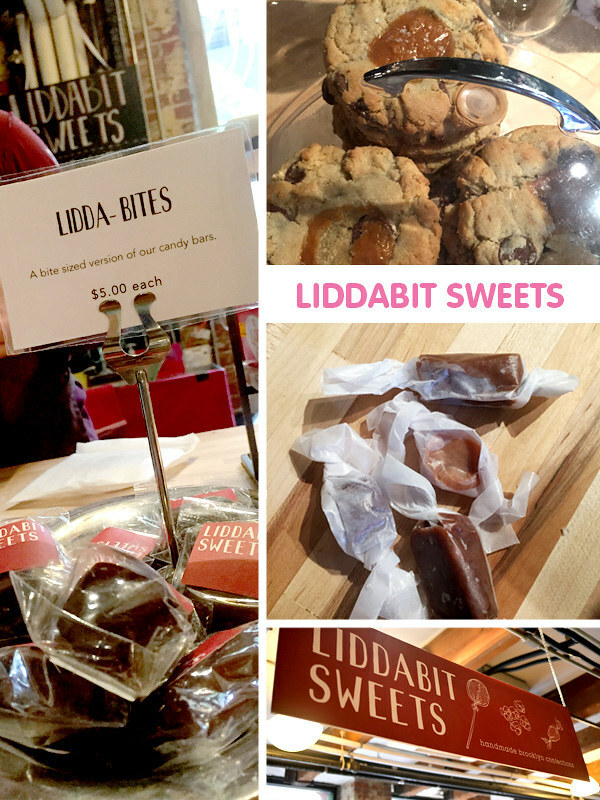 Liddabit Sweets! Caramels, cookies and candy bars. They had a small setup in Chelsea Market and I was glad because we didn’t have time to make it to their shop in Brooklyn. Ahhh Brooklyn! 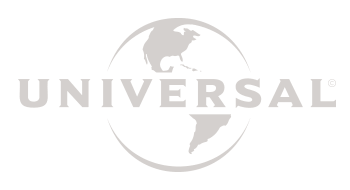 There are so, so many places I want to visit. The Original Baked, Ovenly, Hay Rosie and much more. I’ll just have to plan another trip for all their tasty treats. 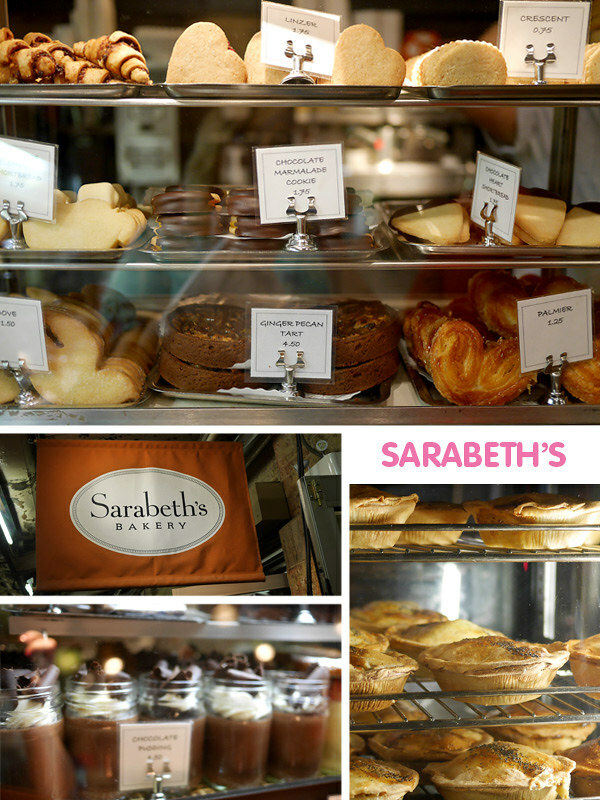 Sarabeth’s – more goodies galore. 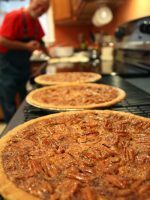 Buttermilk Biscuits, cookies, tarts, pastries, pies and chocolate pudding, too. I had to take Angela by Magnolia Bakery to adore their beautifully swirled buttercream frosting. We left with cupcakes and tried the Banana Pudding in the car on our way to our next stop for chocolate. 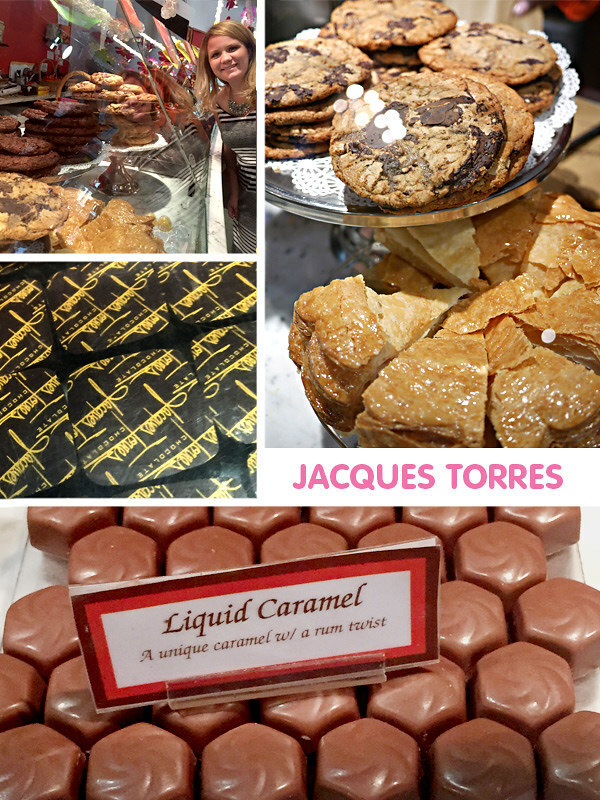 Jacques Torres Chocolate! I don’t remember what flavors I had but one thing I can recommend is his recipe for chocolate chip cookies. I make them often and always with people adoring them! After chocolate we went to the place known for inventing the Cronut. Of course by the end of the day we had to settle for Dominque Ansel’s other amazing treats. 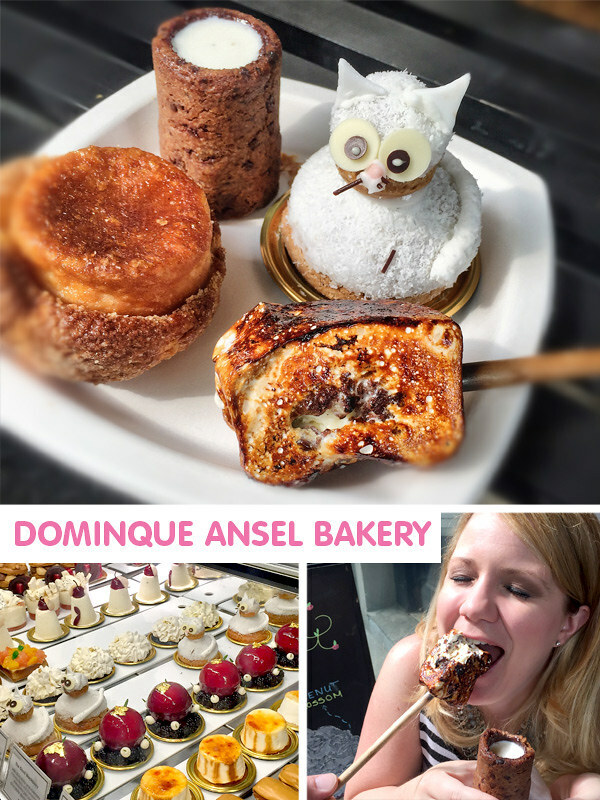 S’mores on a stick, Cookie and milk shooters, Coco the cream puff cat, and the kouign amann… a croissant-like dough with a caramelized crunchy crust. That one was my favorite. 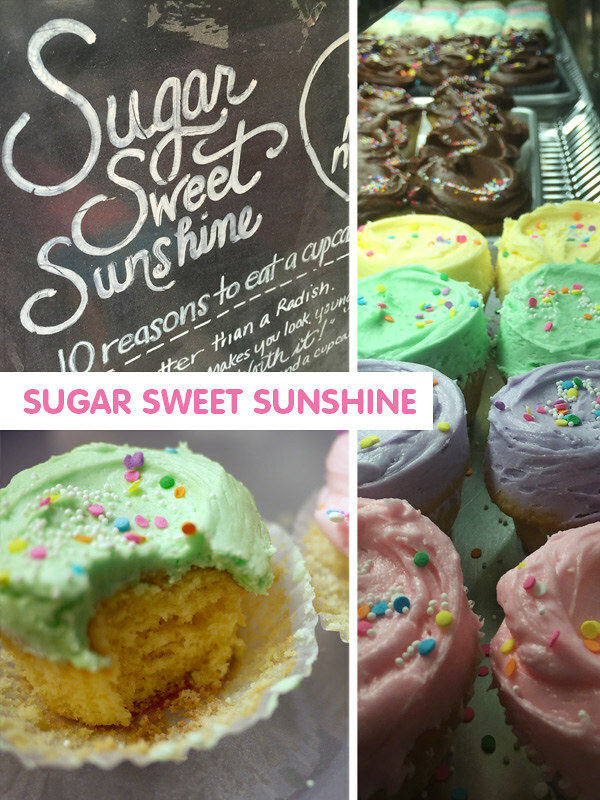 Sugar Sweet Sunshine is another cupcake bakery we stopped in. 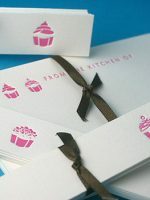 I enjoyed their vanilla cupcake best, but if I could top it with Magnolia’s frosting, then I think it would be perfect. 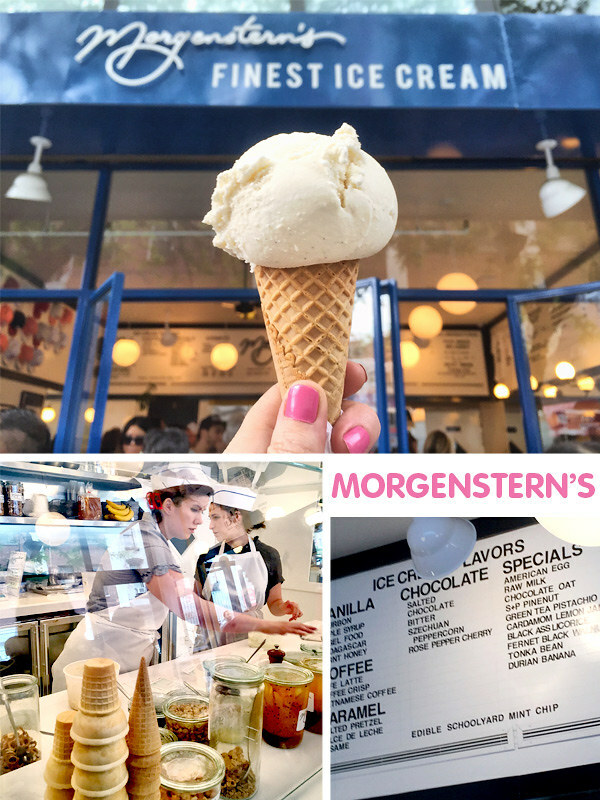 We ended the day with ice cream at Morgenstern’s. The ice cream parlor feel makes you want to hang out while you chill with your ice cream in hand. Such a cool little spot. And I love the paper hats they wear, too. So that was all done on day one. Angela and her husband were so awesome to hang out with for the day. I hope you guys had a great time and enjoyed the rest of your weekend in the city. The next day… because I obviously didn’t have enough sugar on Saturday, I stopped by a few more places with a friend who lives in the city. 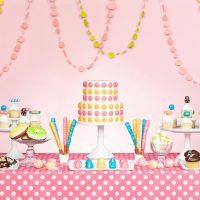 Lady M – Gorgeous cakes and confectionary masterpieces. 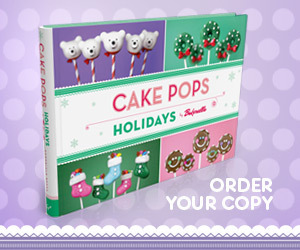 Try their signature Mille Crêpe Cake. Amazing! I love the simplistic decor. It’s stunning in white and really showcases all of the desserts. 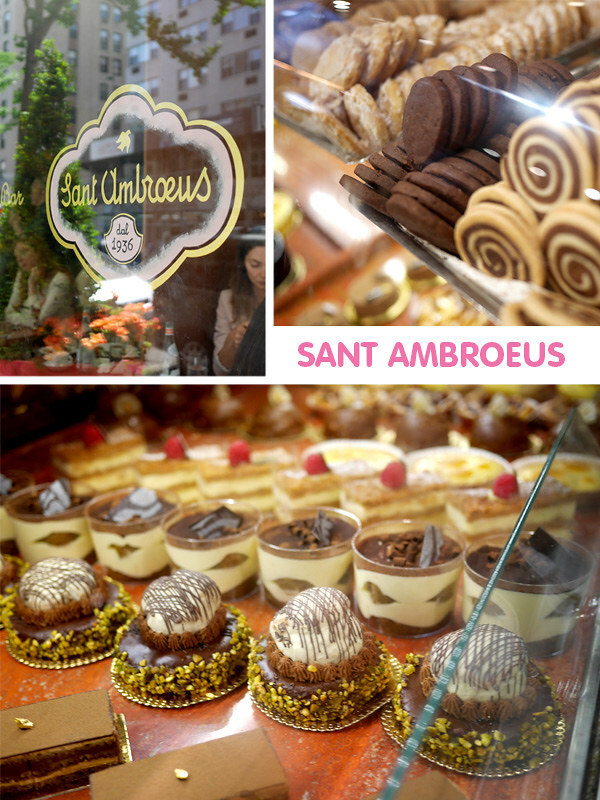 My friend and I stopped in Sant Ambroeus on Madison Avenue. I had a proscioutto sandwich and just adored everything else. 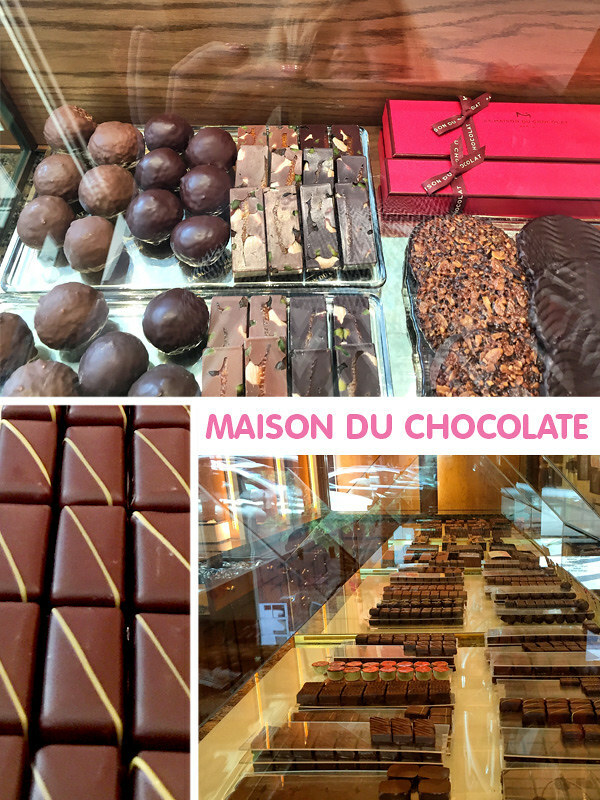 At Maison du Chocolate we enjoyed champagne truffles. The last place I visited in NYC was Ô Merveilleux. And OMGoodness. It was one of the best things from the entire trip. This ever so light meringue sweetened with whipped cream and covered in belgian dark chocolate shavings. 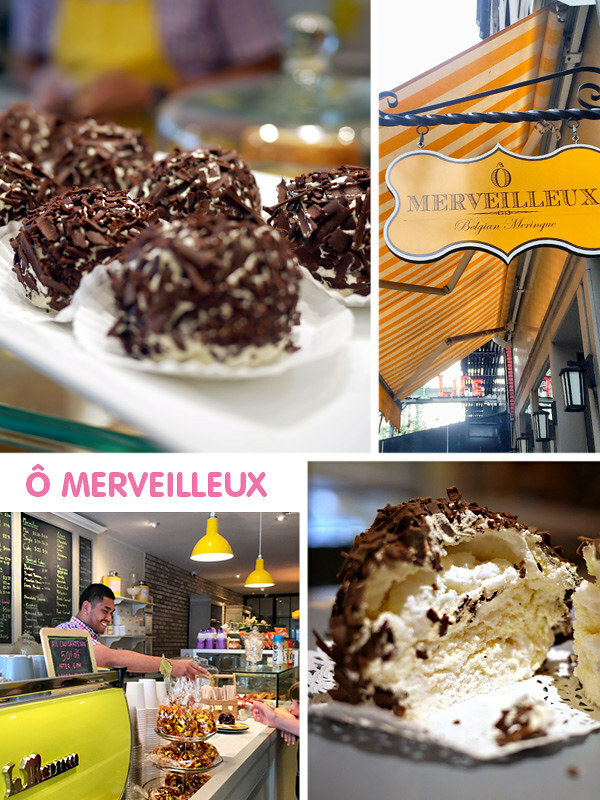 Simply Merveilleux or Marvelous as they say in the shop. Okay, that’s it. What did I miss out on? What should I try next time? And if you have any Brooklyn recommendations, I love to hear your thoughts on those too. Omg! 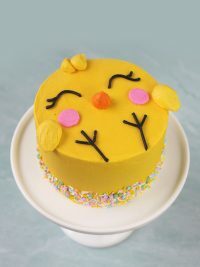 So many fun and yummy sweets! These pictures are awesome and it looks like you had such a great time! How delicious! Next time you HAVE to go to Molly’s cupcakes. 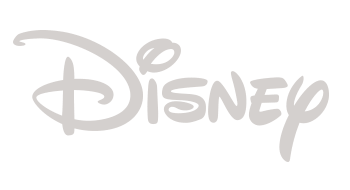 Seriously, the best! Looks like a “sweet” trip! I’m hungry! What an amazing trip! 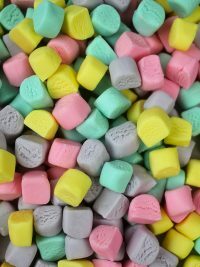 I want to try all of these sweets so much! 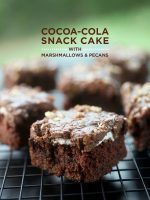 I really have been craving to go to Milk Bar especially, I’ve just finished reading the cookbook. Everything in there looks so amazing! Wow Angela. Oh, the sugar! I’m definitely taking note of a few of these sweet shoppes for my next visit to NY. I’m also re-inspired to continue trying to perfect my own French Macarons at home after seeing so many perfect examples-lol. By the way, I noticed your reflection in one of the windows and you appear to be holding an Iphone. Were all of these lovely photos snapped from your phone? Thank you for an exceptional tour of Manhattan’s bakeries. Here in Paris, les Merveilles come in a flavor spectrum. 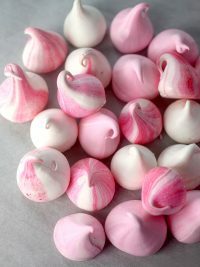 By far the most delicious, in my opinion, is the speculoos cream merengue. If it also exists in New York City, you might like to try it, as well as champagne truffles from the Swiss chocolatier Teuscher. These are small, Alp-peak shaped snappy chocolate shells filled with a plug of champagne cream amid darkest ganache. They’re taste and texture dreams. Jamie b – I tried Molly’s in Chicago. They are great and it was the cutest little cupcake shop. Lisa at celebrate creativity – I used my iPhone for a bunch but I also used a small digital camera. 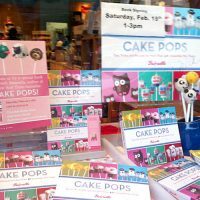 Susan Sherwood – yes they have the speculoos too but the chocolate was my favorite. They were so delish and such a treat. Thanks for the truffles tip. Holy moly! That is A LOT of treats. And, honestly, I woulda been with ya every step of the way. My sweet tooth is outta control. I’ve had Magnolia Bakery’s cupcakes and you made me realize its been about 5 years. TIME TO GO BACK. Holy cow that trip is a dessert lover’s dream come true!! Serious eye candy – thanks for sharing. I’m super obsessed with cupcakes and haven’t been to New York (yet) so it was fun getting to live vicariously through your blog and see all the marvelous cupcakes!! I love when you do this type of trip and do the leg work for us. I just wish I could take the trip and enjoy these first hand. I do live near Denver, CO and hope to one day go to the places you visited on that trip. Next time you are in NYC you have to try Two Little Red Hens on the upper east side. They have the most amazingly decadent Brooklyn Blackout Cupcake and Chocolate Peanut Butter Fudge Cupcake. Seriously my favorite cupcake in the city by far. 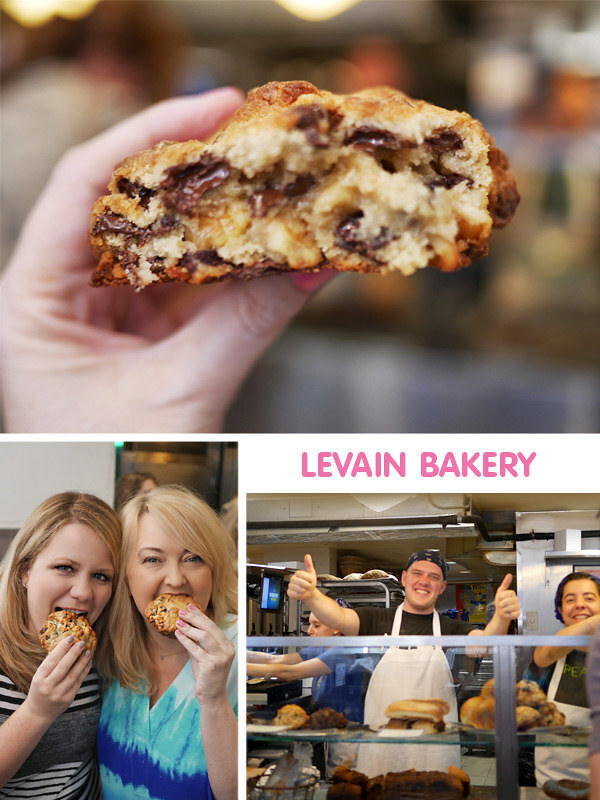 Levain absolutely has the best chocolate chip cookies!!!! OK, clearly, I need to visit New York again after seeing this post! How did I manage to miss out on all these places when I first went there?! 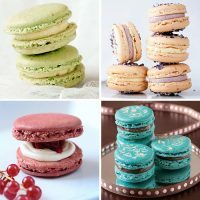 I love how pretty the macarons look, so adorable in their pretty pastel colors! 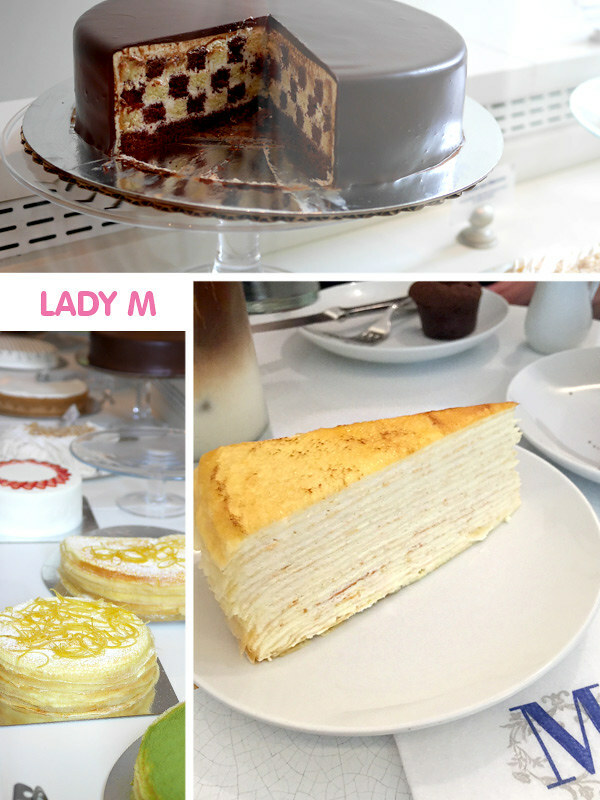 I would really love to try the Mille Crêpe Cake, that looks sooooo good. In Japan there is a French style pastry shop around the corner in every neighborhood, I was so spoiled. Nothing like these where I love now but so glad to know they exist! What a fun trip, what a lucky winner! 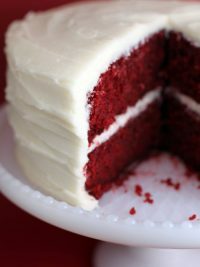 Next time I get a craving for sugar, I think I’ll just come back to this post and drool! Hi Angie ! 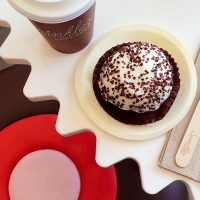 I’m hoping to visit New York THIS WEEKEND for my birthday and trying several of these shops for the first time (Milk Bar, Sprinkles, Baked by Melissa… )! I am sooooo excited to recreate part of your tour!  :-D Do you have a recommended way of getting around to these shops in NY? 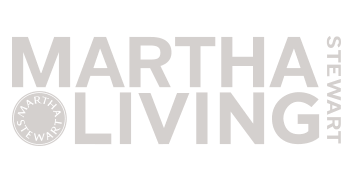 … by foot/car/train….? This trip of yours is just WOW! Joined Weight Watchers a few days ago and figuring out how most of these treats fit into their plan. LO L. Glad I’m not in NY right now. Goodness…the Ansel Bakery??? Looks like I could stay there all dang day!  Between you and P-Dub talking about NYC…gah. Now I REALLY want to go!! OMG! Did you guys have everything in just one weekend? So jealous! hhahaha! 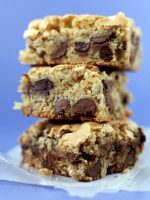 Gained 5 pounds just drooling over this post – Double Yum!! oh my god images are just eye catching and mouth watering.You can also find delicious cookies over here. So much fun and so delicious! My kids love the ladies at Sugar Sweet. They are regulars there, and their photo is on the wall. It is their favorite place for a Sugar Sweet treat! So glad you enjoyed your time in NYC. For doughnuts – next time – go to Dough. The owner is lovely, and her wares are delish! I need need need to get to New York one day to do this!! I too want to get to Brooklyn … don’t forget about Robicilli’s!! I have had a few bakery tours of London so I guess I can’t complain too much, but still. New York is where it’s at!! I see a trip in my future! Thanks for the post! Everything looks delicious ???? I’ll try to do this tour when I visit NYC. I am in NYC this week! 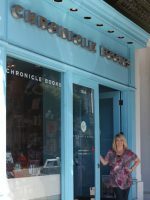 I have been to Laduree and Georgetown Cupcake today! Both were awesome! 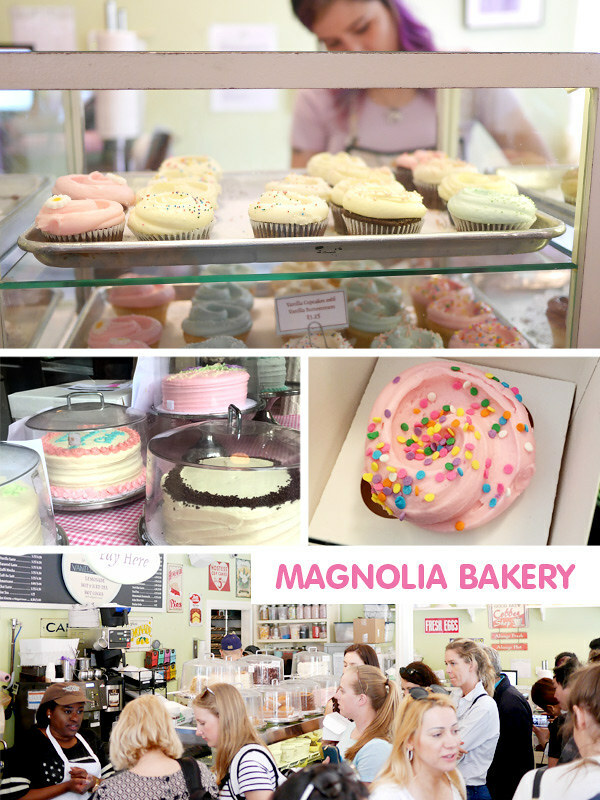 I went to Magnolia Bakery a couple of days ago. Tried their cake slices, coconut and carrot cake. 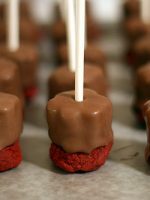 They were so fresh and yummy.. you can’t go wrong at any of these places for a sweet treat!